Beauty is natural, using makeup an art. 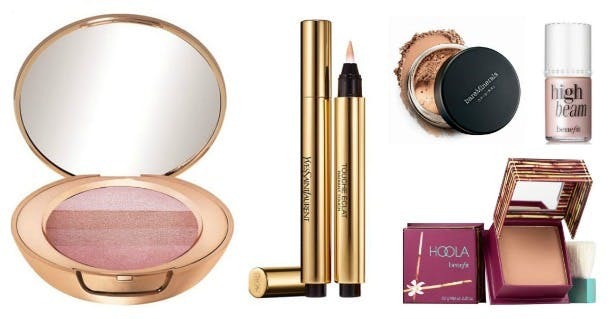 Discover the best beauty buys and classic cosmetic must-haves to even your skin tone, highlight cheek bones, lengthen lashes and more. You don’t have to wear a lot of make up to enhance your natural beauty; the trick is to find the right products for your skin type, colouring and tone, and use them simply to make more of your own natural beauty. Touche Eclat by Yves Saint Laurent is a well-known classic that every woman with dark under-eye circles needs to own. It can also be used to lighten darker areas of the face to cleverly disguise shadows and lines. Bare Minerals is gentle on even the most sensitive skin and ideal for anyone with blemishes as it won’t clog pores. This foundation is a light, silky soft powder that covers as effectively as a cream foundation. Benefit’s High Beam is a brilliant highlighter, affectionately known as the ‘supermodel in a bottle’. 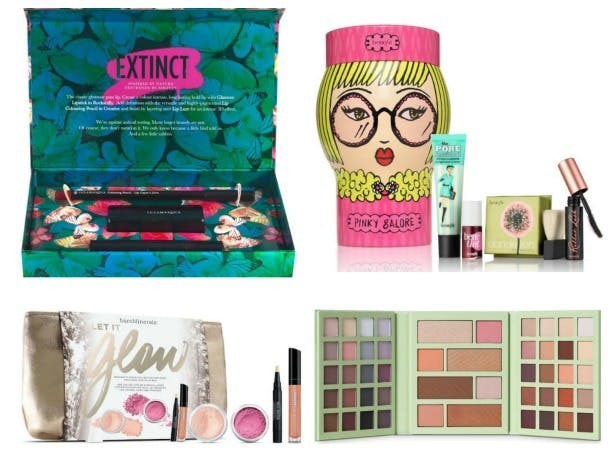 Benefit’s Pinky Galore Collection contains four of trusted brand, Benefit’s most popular cosmetics, with natural look primer, lip tint, blush and mascara. Complementing all skin tones and suitable for use under or over make-up, this silky, lightweight primer is oil-free and gives a radiant finish. The Let It Glow Essential Make Up Collection from bareMinerals is designed to illuminate skin. This four-piece set contains everything you need to achieve a flawless, natural-looking complexion with a healthy-looking radiance. Benefit Air patrol is a wonderful eyelid primer containing SPF 20 and a complex known to help guard your delicate eyelids against sun, smoke and pollutants. 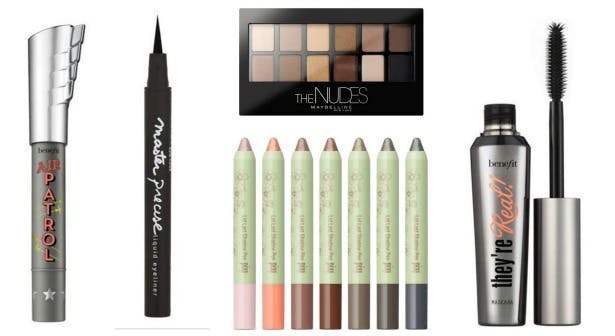 It will extend the wear of eyeshadow for long-lasting colour that won’t crease, fade or smear. Pixi Lid Last Shadow Pen is a cream-to-powder eyeshadow with light reflecting pigments that create brightening and dramatic results without creasing for gorgeous, low maintenance looks. It plumps fine lines for a softened, smooth look with vitamin E to nourish and protect. No brushes required. Laura Geller Iconic Baked Sculpting Lipstick is a long-wearing, non-drying formula that delivers vibrant colour to your pout using unique pigments that have been Artisan-baked for 24 hours. This is a creamy lipstick that glides on effortlessly for comfortable, weightless coverage. Lips are smooth, soft and saturated with sumptuous colour. The hottest colours and styles around for this season are glittery blues and purples, bright orange shades and delicate pinks and golds. Brighten up pale skin with a rich orange colour, go for a sophisticated darker blue or purple for all skin tones, or add sparkle to darker skin with glittery gold or pink. This lavish glittery nail polish by Deborah Lippmann features a long lasting, high shine formula enriched with natural extracts in a high-impact, vivacious violet hue with holographic glitter. It’s the perfect varnish to dazzle on the red carpet or at a Christmas party. 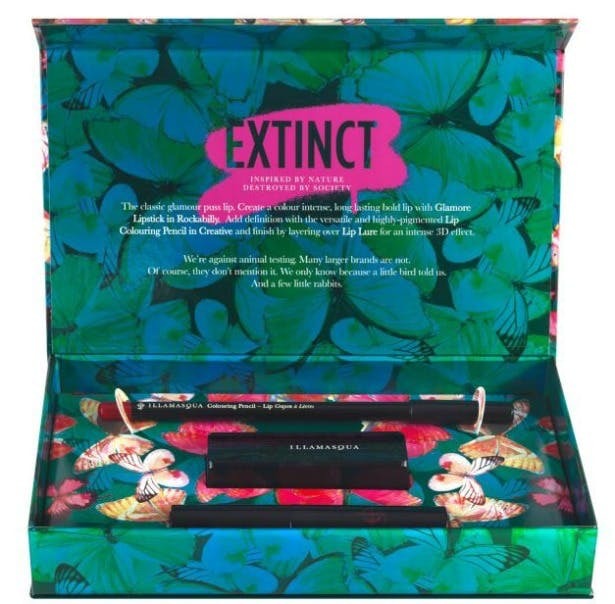 A portion of the proceeds from this varnish is donated to charity. 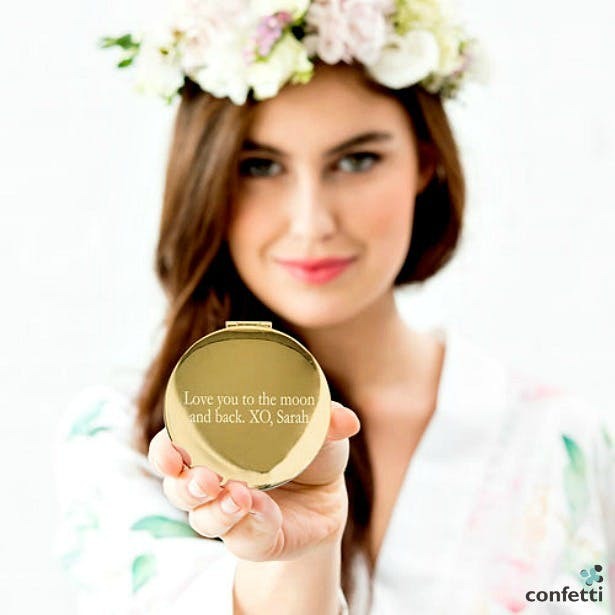 Personalised compact mirrors in a range of colours and styles. Engrave with your own message. Find monogrammed makeup bags in the shop, more hair and beauty inspiration the The Wedding Blog and professional make up artists in the Directory.